Every Wednesday and Thursday night from now until next June, this scene of one-on-one tutoring and mentoring will be realized. Our vision requires that every one of these students starts a job and career of his or her choice by age 25. As they move through our program, they move through our Theory of Change. Some are at step one - building regular participation - while some are exploring step six - career counseling and scholarship opportunities. Hey thanks for all you guys did to help me get where I am today. I was introduced to a great person, my mentor, Joey Molenda, nearly 9 years ago and we are still in contact today! Don't stop molding the minds of our youth and rest assured knowing that your hard work is not in vain! It is feedback like this that deeply motivates us here at Cabrini Connections and the Tutor/Mentor Connection. Likewise, I hope that these words are encouraging to you as a supporter of our work. Please continue to share my blog posts with your friends and family. Talk about Reggie. Talk about Mandy. Talk about our clubs. We always say, "we are one big network." The best marketing is word-of-mouth. Our work speaks for itself. 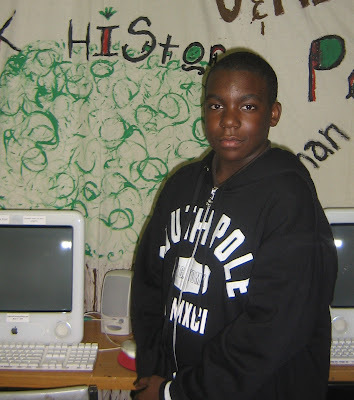 7th grader Reggie Murphy is new to Cabrini Connections this year, but he has already established himself as a star by attending our new Video and Filmmakers Club over the summer. There he learns how to take a story from script-to-screen as the club works on their first movie - a mystery - which they hope to have completed by Halloween. Reggie lives in Lincoln Park and gets up at 6:30am every weekday to attend Oscar Mayer Magnet School. His favorite subject is math and he has won several awards for being a good student and for helping out around the school. He even got to meet the mayor as a reward for his exemplary performance. Well done! Reggie would like to be an artist when he grows up because he loves to draw. His biggest dreams are to own an art store, be a dance teacher, and play baseball. On his way to fulfilling those dreams, Reggie plans to go to college in Chicago, Orlando, Los Angeles, or Atlanta. "A nice town with a lot of people," he says. Reggie has been to Mississippi, St. Louis, Orlando, and Wisconsin Dells, but if he could go anywhere in the world, he would go to the Mall of America (so honest). The happiest day of Reggie's life is every year on his birthday, December 14th. Though some people don't like having birthdays close to Christmas, Reggie takes advantage of it by using his birthday money on Christmas sales. How smart! After a long summer of "chillaxing," Reggie is happy to be back in school. He is also happy to be at Cabrini Connections where he is paired with former Volunteer Coordinator Robert Herrick. He and Reggie got reacquainted last week after having met two times before. In fact, most of our new matches were able to meet before the first night of tutoring; just another sign that we are off to a great start! Congratulations on all of your accomplishments, Reggie. We expect great things from you over the next six years and beyond! Mandy Mullins was born and raised in Louisville, Kentucky, and attended Western Kentucky University before moving to Chicago two years ago. Mandy received a Bachelor's Degree in Advertising from WKU which she now puts to use in her job as a graphic designer in the marketing department of Hinda Incentives. Hinda is one of the nation's leading specialists in motivating employees and sales forces, and providing incentives to dealers, distributors, and clients. For example, if you have ever earned points with your credit card, and spent those points on prizes (electronics, vacations, etc. ), you may have been dealing with Hinda Incentives. 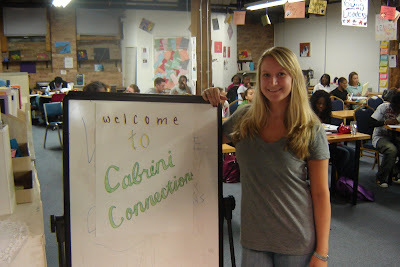 Mandy is entering her second year as a volunteer at Cabrini Connections. Since January, she has been matched with 9th grader Ce'lendria Tharpe. Mandy primarily helps Ce'lendria with homework, but they also talk about her social life. Ce'lendria is pretty open with Mandy, a trust which Mandy says she gained by opening up herself. This serves as a great example for new mentors. Always ask questions of your mentee, but don't be afraid to talk about yourself, too. In her spare time, Mandy likes to play guitar, hang out with friends, and dance. She was on the dance team in high school, has taken tap, jazz, and ballet classes, and is currently in a ballroom dancing class. Mandy also likes college sports (Kentucky doesn't have a single professional sports team!). Her favorite team is the Louisville Cardinals. Mandy isn't sure about her plans for the future, but she has the right attitude about it. "I'm confident that I can move anywhere and do anything," she says. "I like trying new things and I'm excited to do anything." In the near future, Mandy hopes to do some traveling. She has been to London and Istanbul but would love to see more of the world. One of her goals is to save up enough money to visit her former roommate who now lives in South Africa. You can do it! Thank you, Mandy, for being a reliable, dedicated volunteer. We look forward to continued success from you and Ce'lendria. This room will fill with more than 80 students and their mentors over the next two days. We've spent all summer working up to this day and it's finally here! It's the first night of tutoring and mentoring for the 2009-2010 academic year! We have a lot of seniors getting ready for college and a lot of 7th graders who are brand new to our program. It's going to be a great year! Thank you so much for supporting me in this new endeavor. It means a lot to hear my friends say, "I love your blog!" Personally, it's nice to know that people are reading what I post, and professionally, it's nice to know that people are engaging with my ideas. This fellowship is a learning process and you all are part of it. Everyone I talk to and everything I experience is a part of it. I've learned a great deal in 2 1/2 months, but there is much more to discover. I hope you will continue to follow me along the way. As someone trained in Asset-Based Community Development, those words struck a cord in me. To know that the President of the United States thinks akin to me invigorates my credence in this country. His words of inspiration give our youth dignity. "I expect great things from each of you," he said. "I know you can do it." Some people question the "how" of the speech. Is it right for the Executive Branch to issue an address through the Department of Education? That is certainly up for debate. But you cannot question the "what." There is nothing wrong with encouragement to stay in school and work hard, and the more any President is visible and vocal to young people, the better. Postulating on barriers to success in school, President Obama said, "maybe you don't have adults in your life who give you the support that you need." Well, tutor/mentor programs like Cabrini Connections offer that support. A mentor in our program is like a surrogate parent, or a fun uncle. The role is that of motivator, coach, tutor, and advocate. And, while, to youth, these barriers are "no excuse for not trying," we as adults have to understand our responsibilities, too. What would President Obama have said to us today? We need to push and pull as seen in the daigram above. We cannot expect youth to contend with barriers on their own. 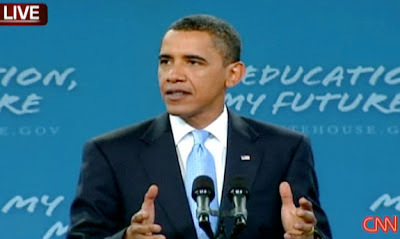 You can volunteer, you can donate, and you can help connect our students with advantages like the ones that made Barack Obama so successful, and maybe one day one of them will be giving a Presidential Address. P.S. Cabrini Connections was on CBS Channel 2 in Chicago last night! You can watch the video here. This new [philanthropic advisory] firm is in many ways shaped by opportunities that Sean created for himself by sharing his thoughts about the industry in public, and encouraging people to challenge him, provoke a conversation, and contribute their own ideas. This is the power of the internet in today's world, and I wish nothing but success for those who use new tools to push their fields, whatever they may be, to important new places. Dan has continually pushed the Tutor/Mentor field to new places for 35 years. Dan blogs, discusses, maps, and tweets with a vision that, because of the work he and others do, more youths born in poverty will start jobs and careers by age 25, and more volunteers will make a lasting commitment to tutoring and mentoring. So if Dan were to start his own Tutor/Mentor advisory firm, what might it look like? Well, perhaps it already exists. 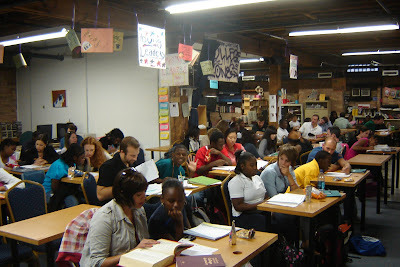 The Tutor/Mentor Institute gathers and organizes all that is known about successful non-school tutor/mentor programs and shares that knowledge to expand the availability and enhance the effectiveness of such services to children in inner city Chicago and other impoverished areas. New programs have started and existing programs have improved based upon T/MI resources. Dan is always available for consultation by e-mail or phone, and all of these services are available for free. It may not be that way for long, though. T/MC is in financial trouble and may not make it through the new year. Therefore, we need to think of ways to monetize T/MC services instead of relying on capricious grantmakers to fund the entire organization. I encourage people to think of T/MC as an advisory firm like the one Sean Stannard-Stockton is starting. T/MC offers valuable consultancy on the Internet, over the phone, and in-person (if you're in Chicago). In the business world, companies pay good money for valuable consultancy because it improves their productivity and effectiveness. 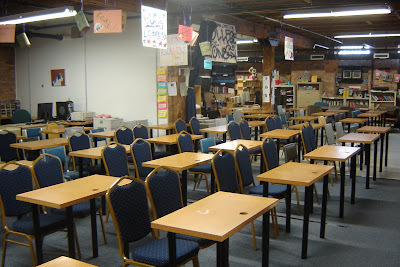 We hope that tutor/mentor programs see our value and, within their means, can make a donation to keep T/MC alive. We also hope that donors viewing this relationship will see its value as well. An investment in youth is an investment in the next generation, and we are all interconnected. "High risk youths who are kept out of trouble through intervention programs could save society as much as $2 Million a youth per lifetime," says Mark Cohen, professor at Vanderbilt University's Owen Graduate School of Management. Every child who is helped by a volunteer-based tutor/mentor program to become a tax-paying adult represents a savings and an investment. In the space where society recognizes the importance of family and schooling, it must also include out-of-school time. Without a holistic approach, we do a disservice to many at-risk youth. I appreciate your willingness to engage with these ideas and I appreciate your support of the Tutor/Mentor Connection. Thank you. Since September 2000, the Tutor/Mentor Connection (T/MC) has been using its Organizational History and Accomplishments Tracking System (OHATS) to document actions that lead to success in the organization's mission. OHATS is an Internet-based system used to record and report important events, actions and lessons that improve conditions necessary for all youth to succeed. More than one thousand accomplishments, lessons, and activities were reported by T/MC staff between September 2000 and January 2008. OHATS is not just for T/MC, though. Our goal is to make it easier for any stakeholder—program, volunteer, donor or business partner—to see, understand, and compare what they do with what seems to be working elsewhere, in a way that leads to constant innovation and improvement in all programs that strive to help inner city youth stay in school, stay safe in non-school hours, and stay headed toward jobs and careers. The idea behind OHATS is simple and proven throughout history: if a community group tracks actions, events, lessons and results that are important to their success, they can learn from them and be more successful. OHATS is an ongoing project. New supporters and users are welcome. We have set up an online discussion group where interested volunteers and OHATS users can discuss findings and talk about ways to improve the system, and the Tutor/Mentor Connection. We need to constantly "create sense" from what has been documented so that T/MC can improve its own efforts and others might learn how to best use OHATS in their own organization or community. If you have any questions, please let me know. I appreciate your interest!